ACOVE Investigators. The ACOVE-3 Quality Measurement Set for Vulnerable Elders. Journal of the American Geriatrics Society. In press. AQA. Defining Cost of Care Measures. Draft working paper accessed online at http://www.aqaalliance.org/may30meeting/PerformanceMeasurement/DefiningCostofCareMeasuresDraftforAQAMeeting05302007.doc on July 2007. Asch SM, Kerr EA, Kersey J, Adams JL, Setodji CM, Mali S, and McGlynn EA. (2006) Who Is at Greatest Risk for Receiving Poor-Quality Health Care? New England Journal of Medicine 354(11):1147 – 1156. Bush, President George W. (2006) Executive Order: Promoting Quality and Efficient Health Care in Federal Government Administered or Sponsored Health Care Programs. Washington, DC: Office of the Press Secretary. Centers for Medicare & Medicaid Services (CMS). (2007) Regulation No. CMS-1392-P. Proposed Changes to the Hospital Outpatient Prospective Payment System and CY 2008 Payment Rates. Accessed online at http://www.cms.hhs.gov/HospitalOutpatientPPS/HORD/itemdetail.asp?filterType=none&filterByDID=-99&sortByDID=3&sortOrder=descending&itemID=CMS1201238&intNumPerPage=10 on July 2007. Hing E., Cherry DK, and Woodwell DA. (2006) National Ambulatory Medical Care Survey: 2004 Summary. CDC’s Advance Data from Vital and Health Statistics of the National Center for Health Statistics No. 374. Institute of Medicine. (2000) To Err Is Human: Building a Safer Health System. Kohn LT, Corrigan JM, Donaldson MS (eds.). Washington, DC: National Academy Press. Institute of Medicine. (2001) Crossing the Quality Chasm: A New Health System for the 21st Century. Washington, DC: National Academy of Sciences. Institute of Medicine. (2005) Performance Measurement: Accelerating Improvement. Washington, DC: National Academy of Sciences. Leavitt MO. (2006) Better Care, Lower Cost: Prescription for a Value-Driven Health System. Washington, DC: Department of Health and Human Services, Office of the Secretary. Litwin MS, Steingberg M, Malin J, Naitoh J, McGuigan KA, Steinfeld R, Adams J, and Brook RH. (2000)Prostate Cancer Patient Outcomes and Choice of Providers; Development of an Infrastructure for Quality Assessment. Santa Monica, CA: RAND Corporation, MR-122 7-BF. Lorenz KA, Dy SM, Naeim A, et al. (2007) Quality Measures for Supportive Cancer Care: The Cancer Quality ASSIST (Assessing Symptoms Side Effects and Indicators or Supportive Treatment) Project. 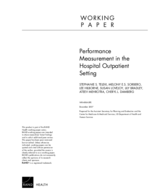 Paper in submission. McGlynn EA, Asch SM, Adams J, Kersey J, Hicks J, DeChristofaro A, and Kerr EA. (2003) The Quality of Health Care Delivered to Adults in the United States. New England Journal of Medicine 348(26):2635 – 2645. MedPAC. (2007a) “Section 1, National Health Care Spending and Medicare Spending,” in A Data Book: Healthcare Spending and the Medicare Program. Washington, DC: MedPAC. MedPAC. (2007b) “Section 8, Ambulatory Care: Physicians, Hospital Outpatient Services, Ambulatory Surgical Centers and Imaging Services,” in A Data Book: Healthcare Spending and the Medicare Program. Washington, DC: MedPAC. MedPAC. (2007c) Report to the Congress: Medicare Payment Policy. Washington, DC: MedPAC. Schuster MA, McGlynn EA, and Brook RH. (1998) How Good Is the Quality of Health Care in the United States? Milbank Quarterly 76(4):517 – 563. Vladeck BC, Van de Water PN, and Eichner J (eds.). (2006) Strengthening Medicare’s Role in Reducing Racial and Ethnic Health Disparities. Washington, DC: National Academy of Social Insurance. Wenger NS, Solomon DH, Roth CP, MacLean CH, Saliba D, et al. (2003) The Quality of Medical Care Provided to Vulnerable Community-Dwelling Older Patients. Annals of Internal Medicine 139(9):740 – 747.